Home > Law Books > Practice Materials > Entertainment and Intellectual Property Law, 2018 ed. Entertainment and Intellectual Property Law, 2018 ed. 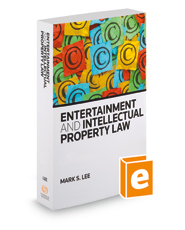 Entertainment and Intellectual Property Law provides practical information by summarizing the legal disciplines of copyright, trademark, right of publicity, patent, common-law copyright, trade secret, misappropriation, and idea submissions law as they apply to the books, motion pictures, music, television programs, plays, people, fictional characters, video games, and titles that are vital to the entertainment industry. Appendixes include relevant state and federal statutes and laws.